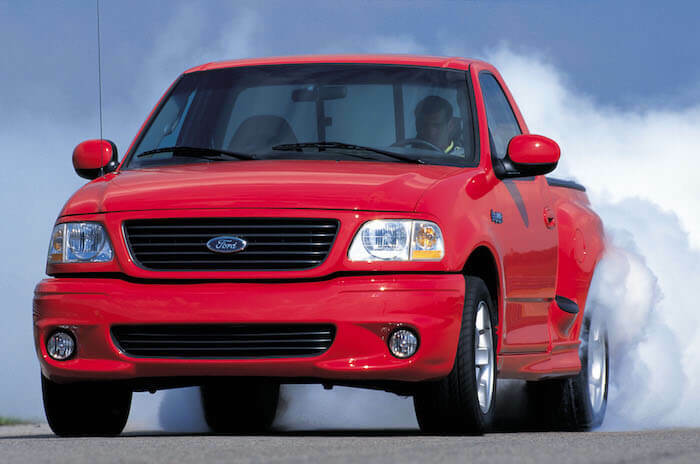 2001 was a noteworthy year for the F-150. That was the year that they introduced the full 4-door cab style called SuperCrew. This body style would prove to be extremely popular in coming years. 2001 would also see the first new higher end trim level F-150, the King Ranch. In the coming years Ford would also introduce additional high end trim levels to satisfy buyers demands for utility and comfort. Harley Davidson SuperCrew replaces SuperCab and the King Ranch F-150 has been added to the line up. Work Series is no longer a separate series and now becomes the Work Truck Option Group - deleting certain content from the XL model (chrome bumpers and wheel hub ornament now argent, chrome grille surround now storm grey, cloth seats now vinyl). Super crew, SuperCab, and Regular cab order guides have been combined. An Off-Road Equipment Group is now available on the SuperCrew 4x4. A new 17" cast aluminum 10 spoke wheel is added to the XLT Sport Group. Storm Grey wheel lip moldings replace black on the XL 4x4. Heated driver and outboard passenger seats are now an option for the XLT and Lariat. 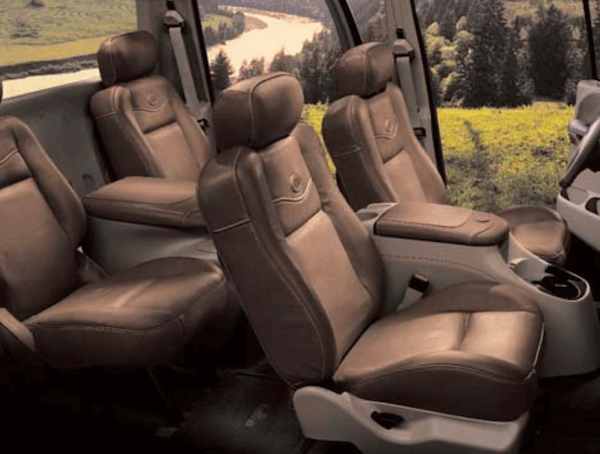 Seat Integrated Restraints have been added to the SuperCab 60/40 split bench and captain's chairs. Manual passenger lumbar has been added to all 60/40 split bench seats and captain's chairs. A 6 Disc CD Changer is now available on SuperCabs with 60/40 split bench seating. Dark Graphite is now an available trim color on XL vinyl and cloth seats. Dark Denim Blue is no longer available as a trim color. Medium Graphite is no longer available as a trim color for XL bench seats. Carpet Delete is now available on the Lariat. Child Seat tethers are now standard. The XLT now comes with carpeted, color keyed, monogrammed floor mats as standard. A color keyed leather wrapped tilt steering wheel and remote keyless entry (with 2 fobs) is now standard with XLT. The Lariat now comes standard with an electrochromic mirror. XLT cassette radio is now replaced with single CD AM/FM stereo radio with premium sound and four speakers as standard equipment. Cassette and Clock are now added to the XL AM/FM stereo package. Also new dual lighted visor vanity mirrors are now standard with the Lariat. The 4x4 Work Truck Option Group is now available with all terrain tires and 4-wheel anti-lock brakes are now standard on XL, XLT, And Lariat models. One of the words that Ford used quite a bit in their 2001 SuperCrew marketing materials was "garageability". The new SuperCrew truck has more maneuverable and garageability due to it's shorter 5-foot box. So as we mentioned earlier, the 4.6L Triton V8 engine received a power bump. It is called the PI or performance improved engine. It had upgraded heads for improved airflow, and it also received the coil-on-plug (COP) ignition system that the 5.4L V8 had. It's compression ratio was increased to 9.3:1 to increase fuel economy. The 4.6L V8 in the trucks was a "truck-only" version of the engine, not the same as what was put in Ford cars such as the Mustang, Crown Victoria, etc. Ford and King Ranch teamed up when Ford became interested in building a more upscale Western truck. Ford and King Ranch have similar customer bases and "image targets," and both companies have strong working histories. The relationship offers Ford the opportunity to create a limited edition upscale vehicle that will reach a unique group of customers, and it offers King Ranch the opportunity to nationally promote and strengthen the King Ranch name via an association with one of America's strongest brands and the number-one name in trucks, as well as obtain publicity through automotive press. The lineup for the 2001 F-150 included XL, XLT, Lariat, King Ranch, or Harley-Davidson F-150 models. The SVT Lightning was still available also. The Work Series from last year is not a trim level, it is an option package on the XL trim now. Interior color choices in 2001 included Dark Graphite, Medium Graphite, and Medium Parchment.